A seabirding trip to the Izus, Ogasawaras and Iwo Islands must be an “out and back” expedition, unless everyone has the time and inclination to sail to or from the Northern Marianas, which we didn’t. So, some of the same areas were visited on the way back towards Tokyo, but there were surprises both above and sometimes below the water. Some new birds were seen and we had better views of some species encountered earlier. 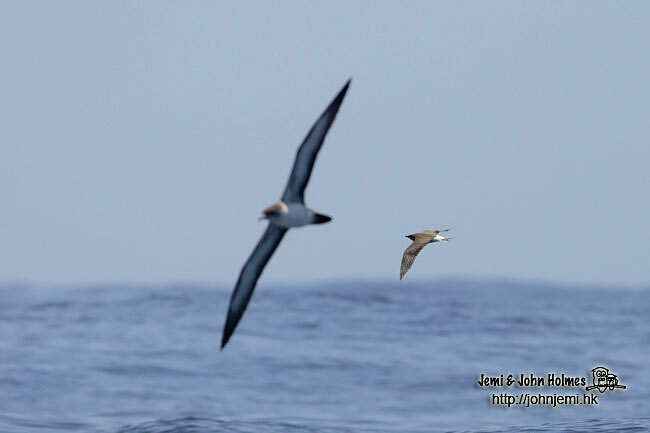 We didn't see as many migrating waders as I thought we might, but here is an Oriental Pratincole with and o-o-f Wedge-tailed Shearwater, two species you don't always get in the same frame ! 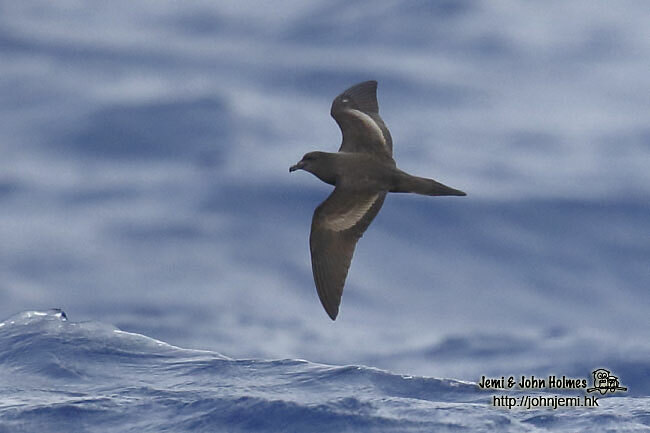 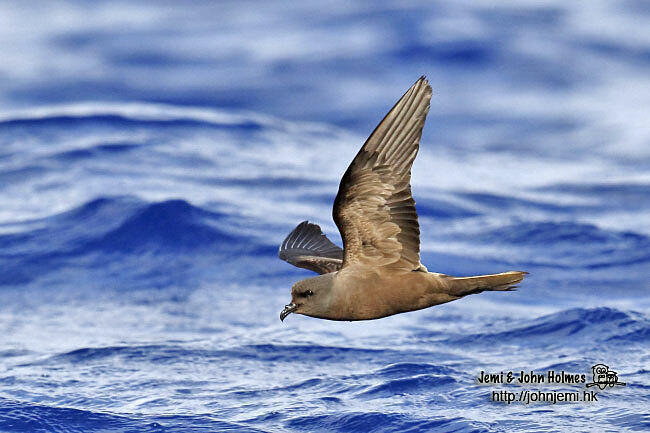 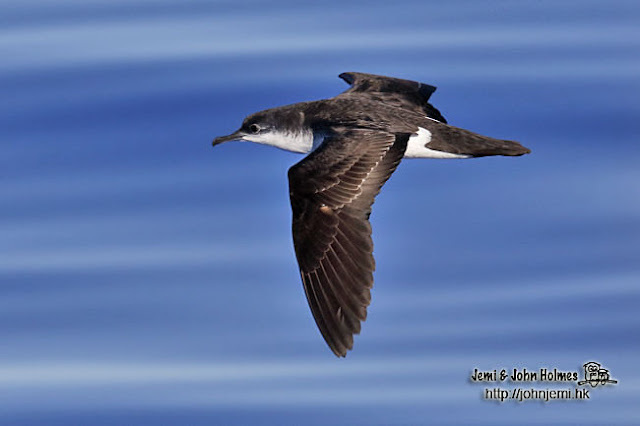 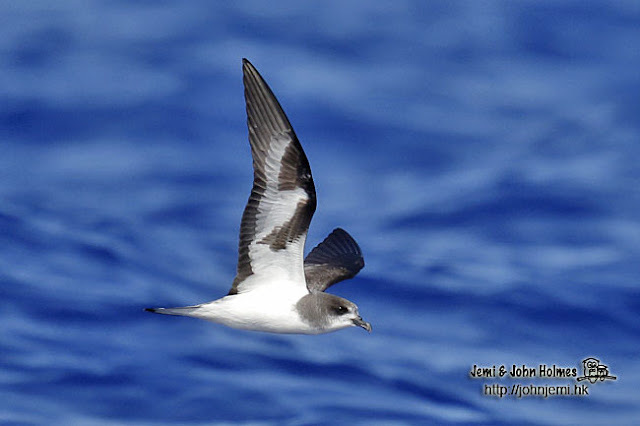 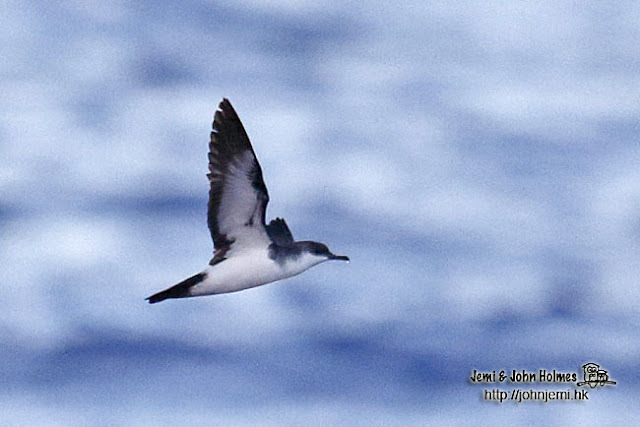 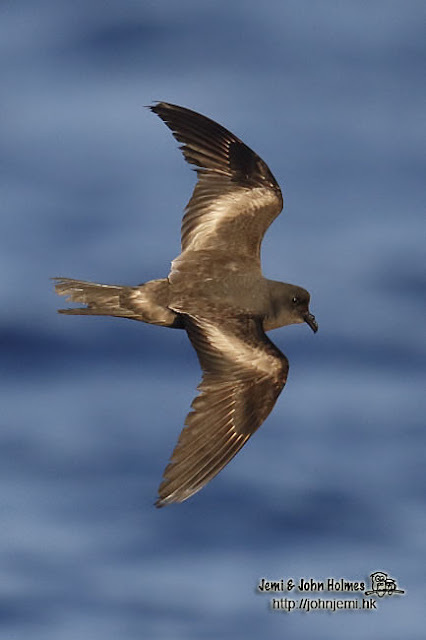 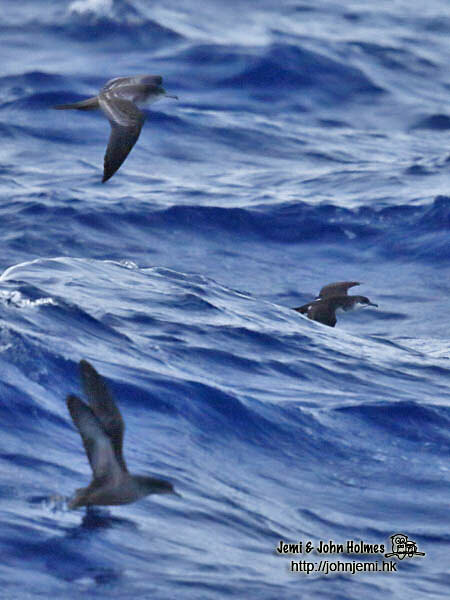 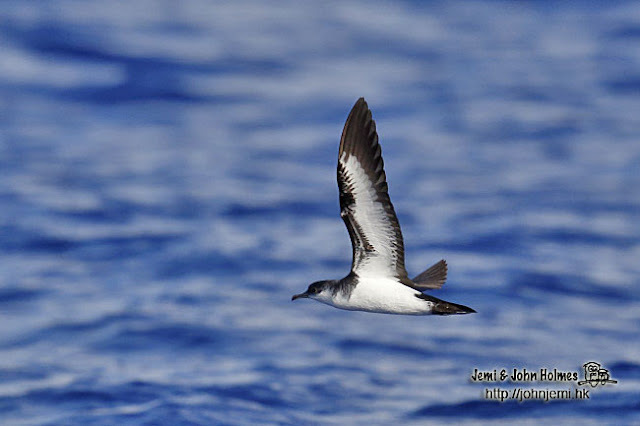 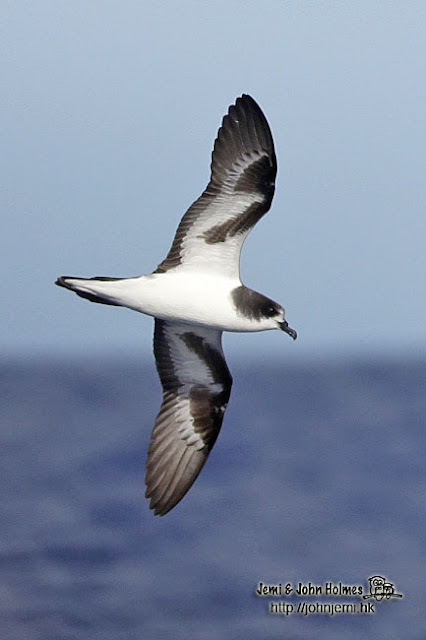 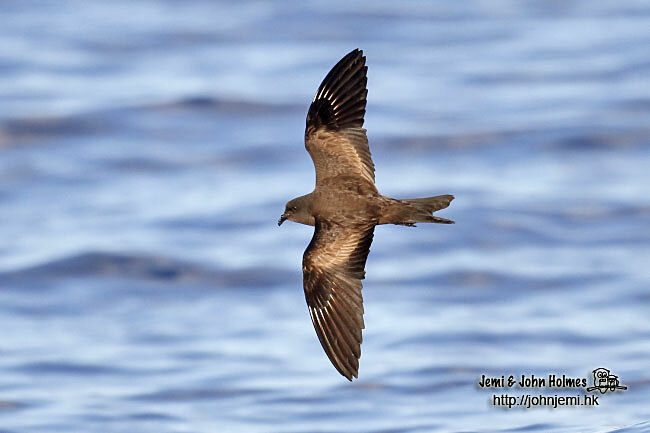 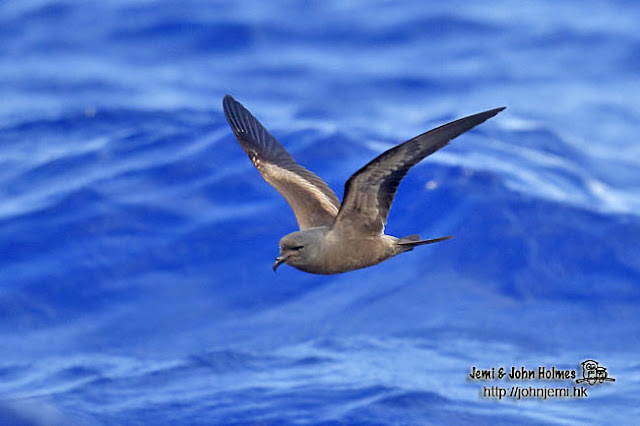 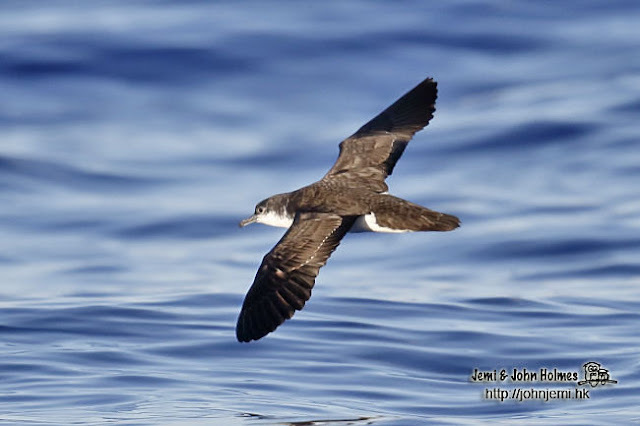 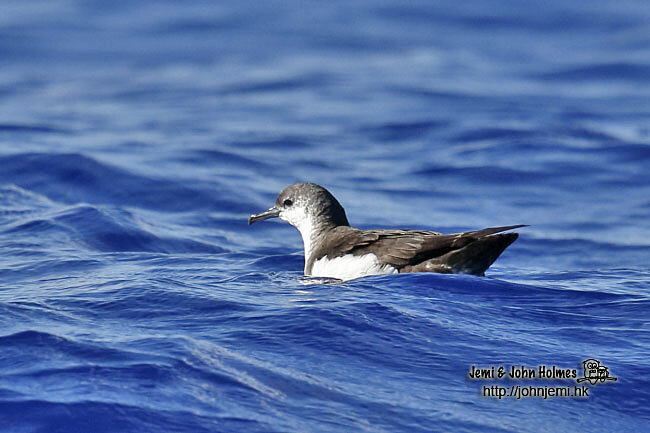 A few Bulwer's Petrels were seen daily. There is only one HK record of this species, a moribund one found in a park in Kowloon after a typhoon (June 2012). A dorsal view of another Tristram's Storm-petrel in a patch of late afternoon sunshine. Anything with a white rump drew our attention, here another Leach's Storm-petrel. 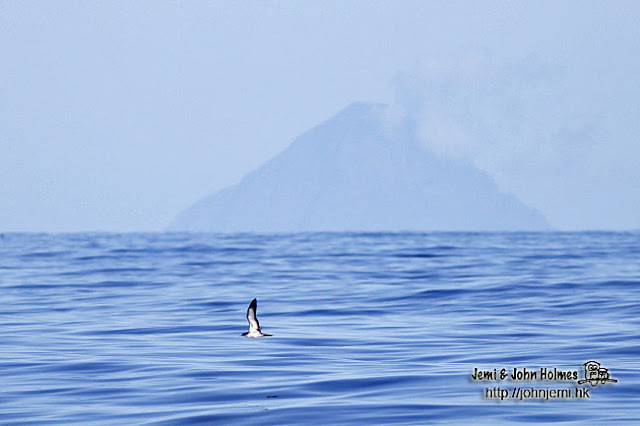 On the way back to Chichijima we had a pod of Pan-tropical Spotted Dolphins at daybreak. 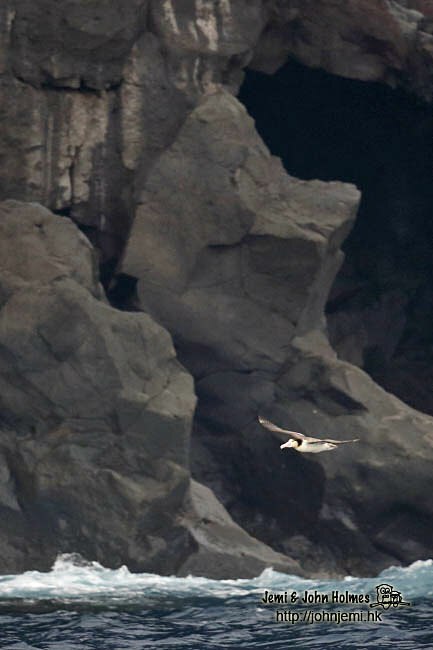 Here is a shot from an earlier sighting, though, when the light was better. 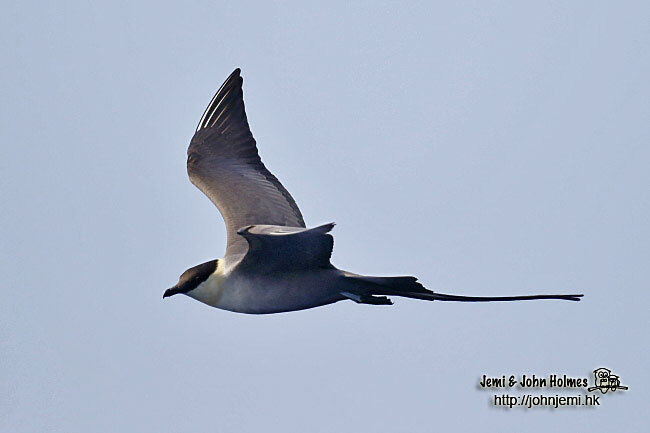 Overhead, a Long-tailed Skua, one of several seen during the trip. 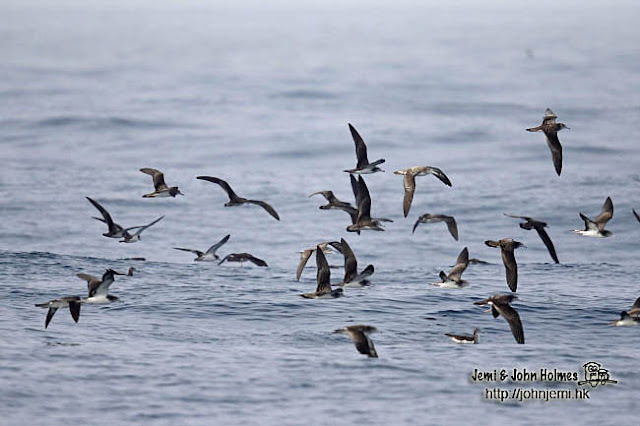 On May 12th we returned to the waters east of the breeding colonies of Higashijima, and, unlike on the way south, found rafts of shearwaters, mostly Wedge-tailed, loafing on the water. Three shearwater species here, Wedge-tailed, Short-tailed and Bannerman’s. 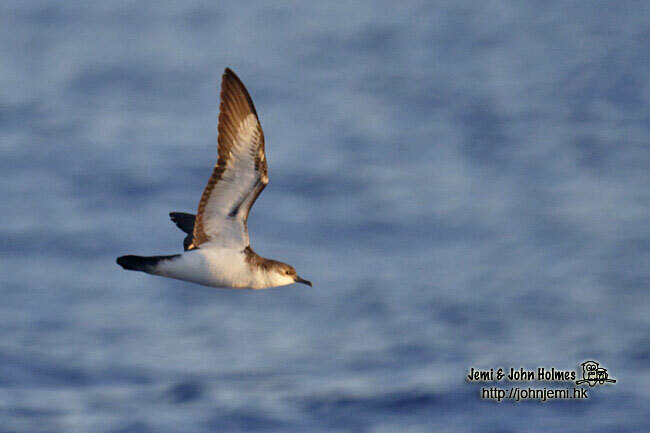 Another individual Bannerman’s in the fading light, but no sign of Bryan’s Shearwater. 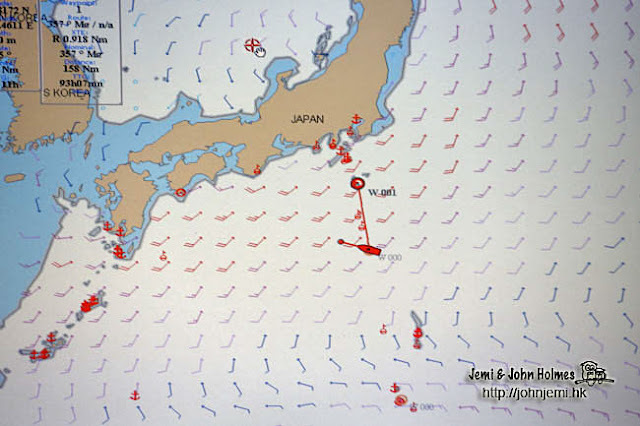 So, we continued north, with another stop at Torishima. Didier and Sophie have state-of-the-art satellite weather information on the Yacht Sauvage, and we were aware that Torishima (home to Short-tailed Albatrosses) had had a bit of a lashing from Typhoon “Noul" a few days earlier. “Noul" had gone northwest, but the weather was also being affected by Typhoon “Dolphin" to the south of us. 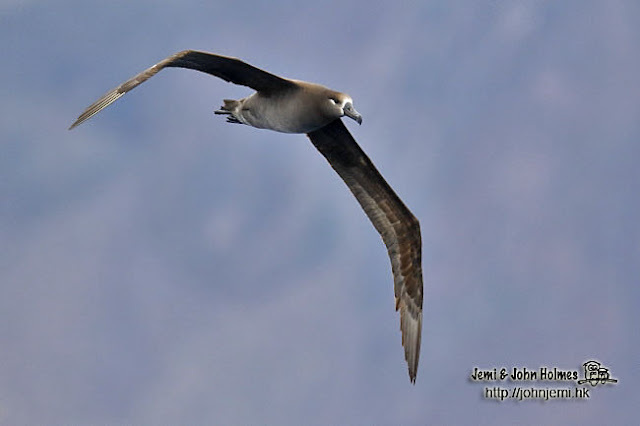 When actually got to to Torishima It was still calm enough for a few more “Albatross in front of dramatic Torishima backdrop” attempts with the camera. Once back in the heart of the Izu Islands, near Mikurajima we saw large numbers of Streaked Shearwaters in late afternoon. 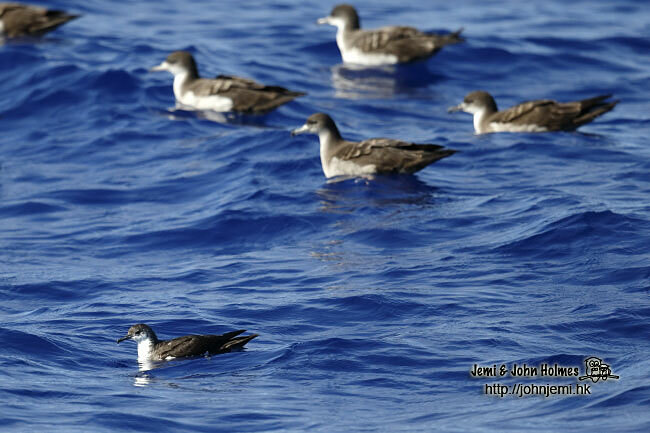 They were rafting prior to returning to their breeding areas on the island. 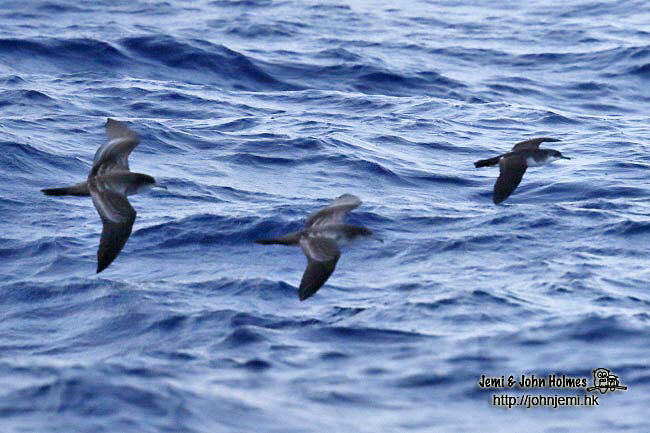 A steady procession of them passed the bow of the boat in the final hours of daylight. Soon we were back in the Yokohama (Port of Tokyo) shipping lanes, where some sailing hazards are very much man-made. 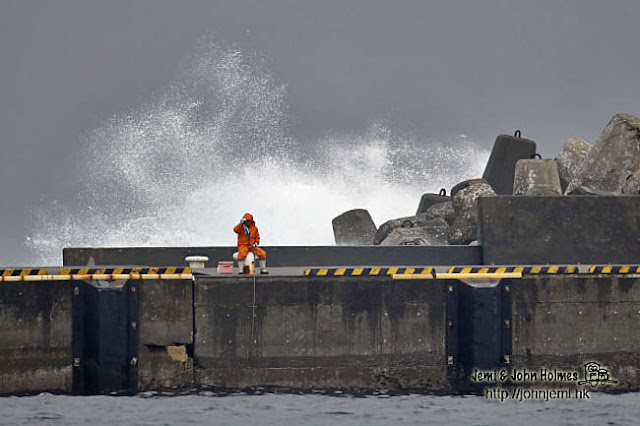 By the 19th May, even though Typhoon “Dolphin” was still over 500km to the south, the seas around Miyakejima were rough, and we spent the day in the shelter of a breakwater in the harbour there. 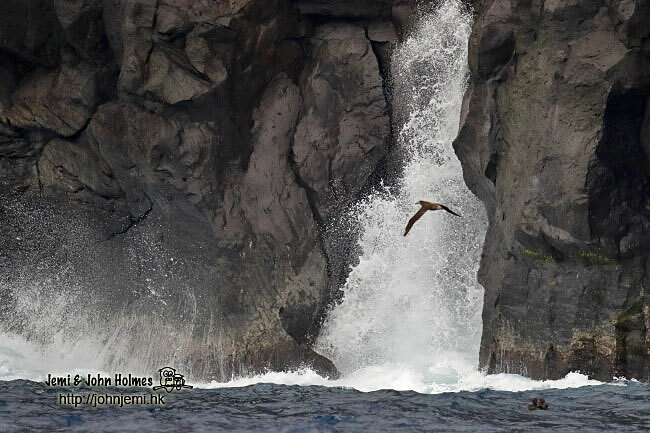 When the waves weren't too rough we could hear Japanese Bush Warblers calling from the scrub beyond the shore. Leaving Miyakejima in calmer seas the following morning, we circled the rocky islets of Sambondake in a heavy mist that lightened as the morning went on. We saw several Japanese Murrelets, this adult with downy chick being the closest that we came to them. The following day we were planning some birding off Oshima, but at daybreak another squall prompted Didier to take shelter in the picturesque port of Habu. 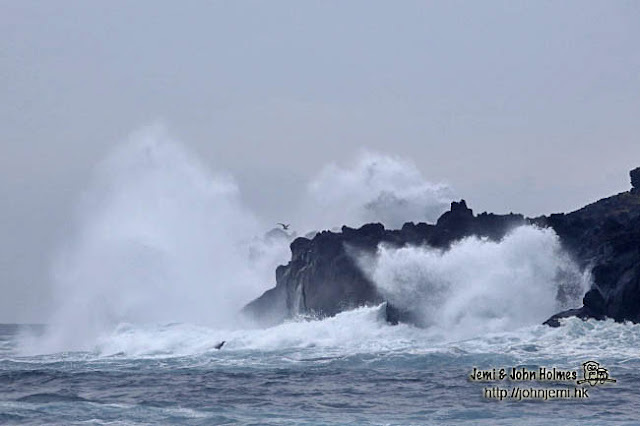 Here are two shots of waves breaking near the port entrance. 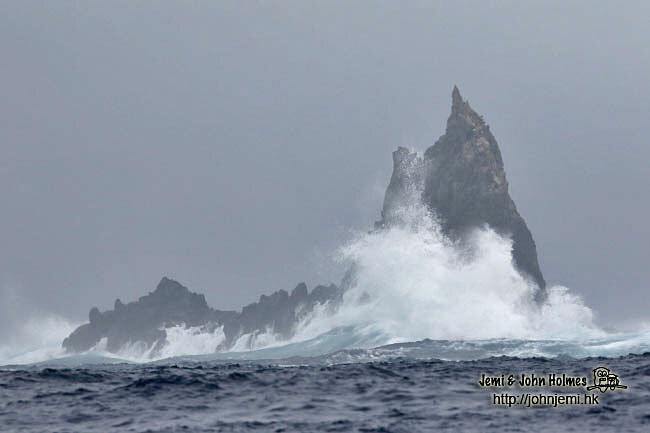 By this stage, of course, we had complete confidence in the ability of our hosts to keep us safe in the roughest of weather. 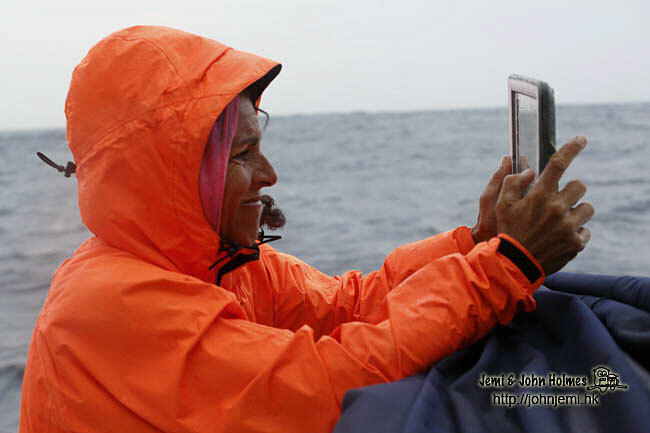 And, despite the conditions, Sophie could always manage to get some photos. 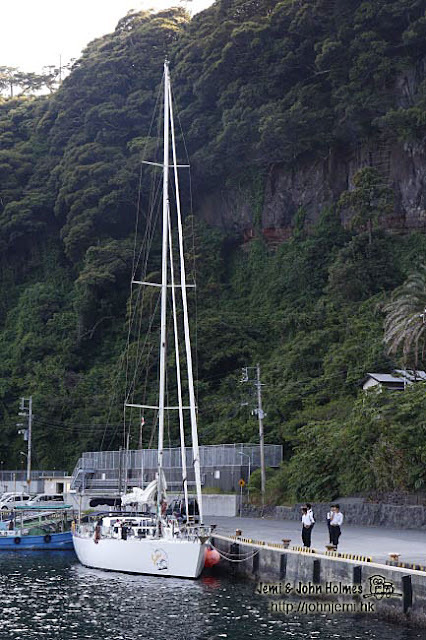 Habu turned out to be an attractive tree-lined caldera where we could hear Lesser Cuckoo and Chinese Bamboo Partridges from the boat. 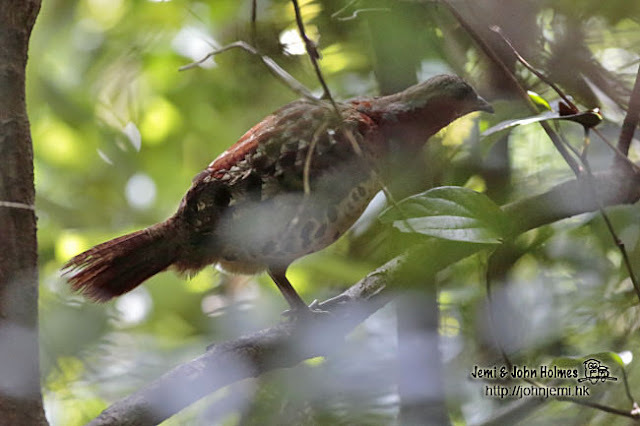 A day birding the hillsides of Oshima resulted in a view of a pair of these Chinese Bamboo Partridges as one of the highlights of the day. Oshima, though an unscheduled stop, turned out to be an interesting place to spend our last full day of the trip. Here, not a sunset, but a sunrise - taken at Habu Port as we left Oshima. It only took the morning to return to Misaki, where we had started 25 days earlier. 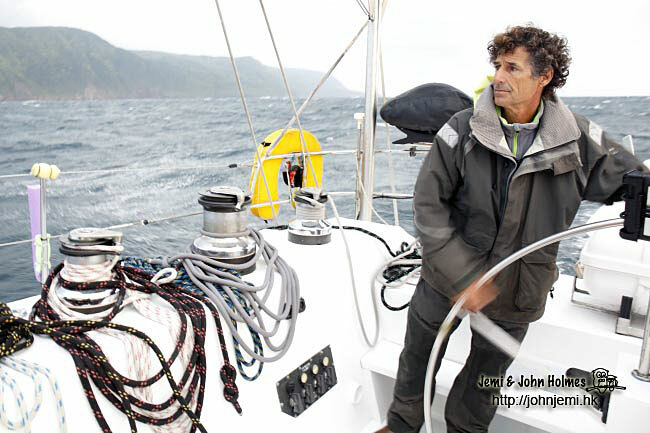 At the quayside we said “Au Revoir” to Didier and Sophie, who were due to set sail towards Alaska a couple of days later. 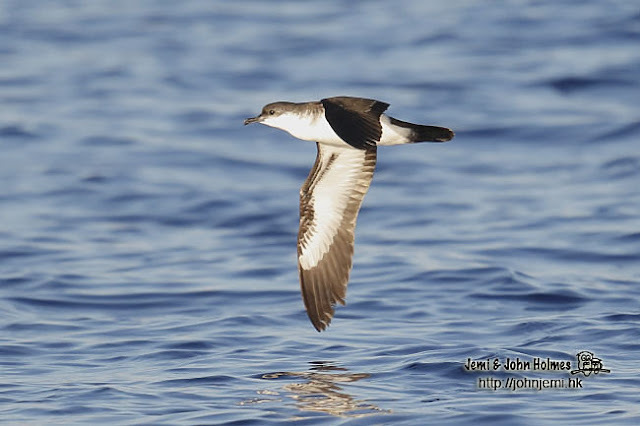 And thanks to Glenn McKinlay and Colin Rogers too, for the pleasure of their company, and their shared enthusiasm for wildlife in general and seabirds in particular. 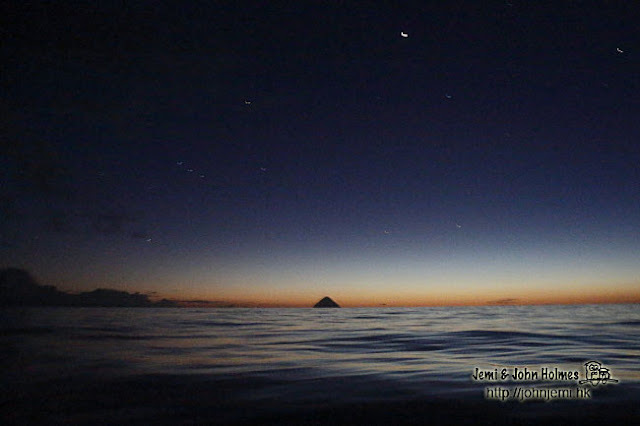 From Misaki we got the train back to Tokyo. 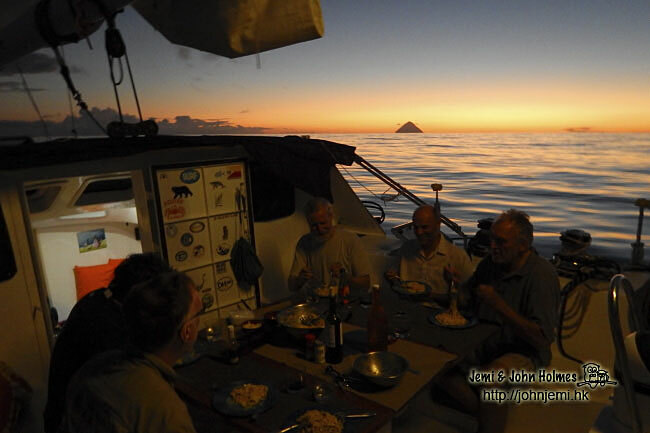 With "Real Life" looming, we said our goodbyes to Glenn, Kirk, Mike and Colin as they got off at their various stations. 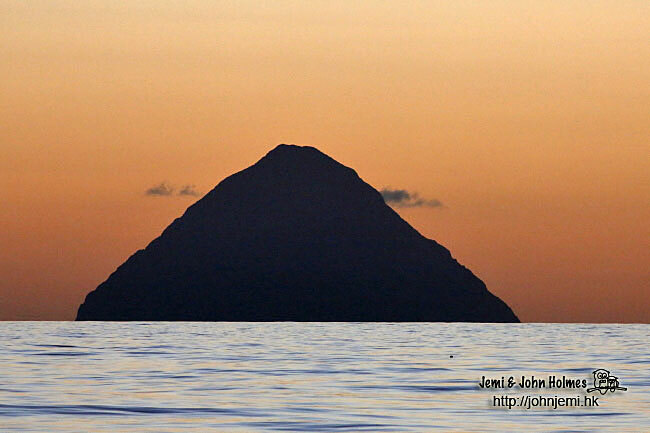 Leaving the Ogasawara Islands behind us, we sailed 330 km south southwest to the Iwo (Volcano) Islands. 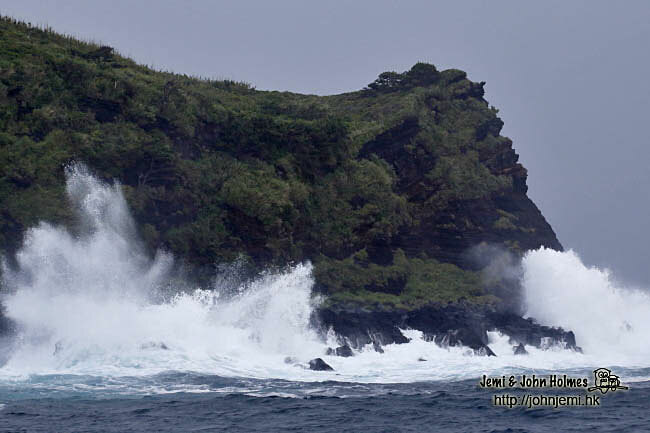 The central island of the small chain, Iwo Jima, has one of those place names that resonates with one event in its history. 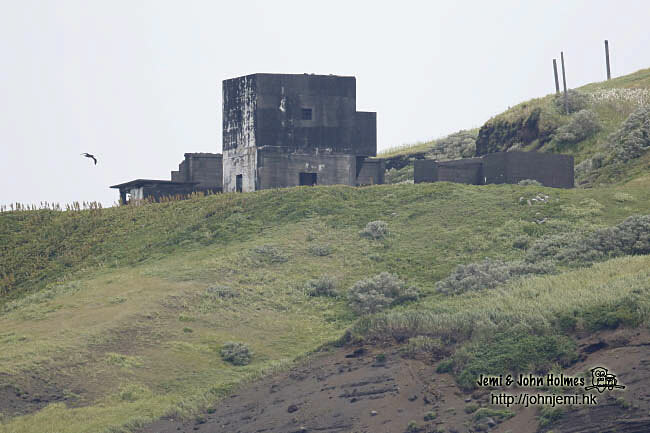 The WW 2 battle site still has a military air base, casual access is forbidden, and there is an “exclusion zone” around the island. 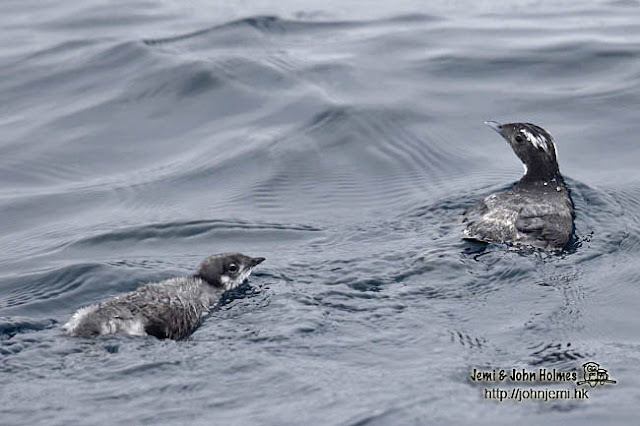 We were heading 30 km further south. 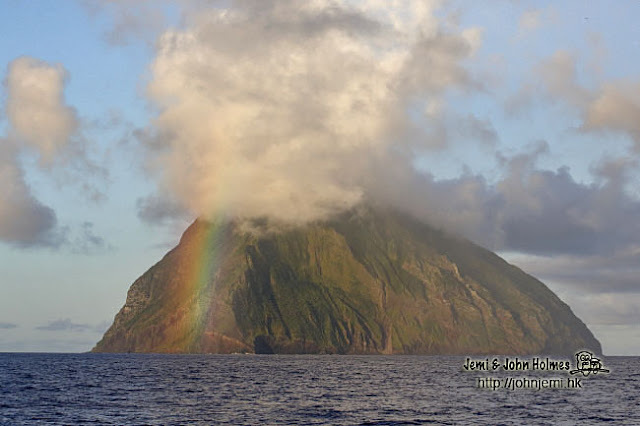 On the morning of May 6th we arrived off Minami Iwo Jima (“South Volcano Island”) and were greeted with a rainbow. 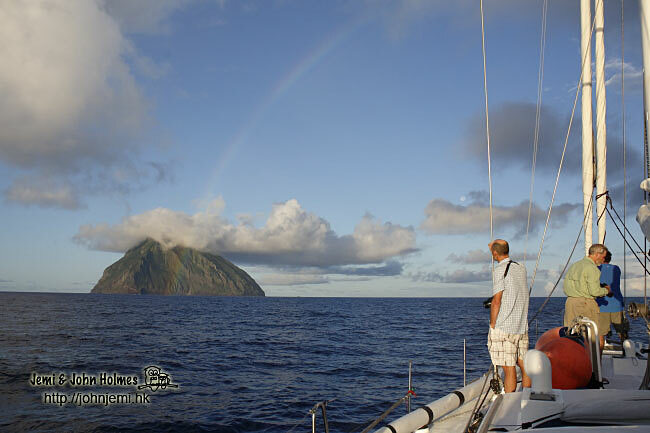 We circled the island once to “take it all in”. 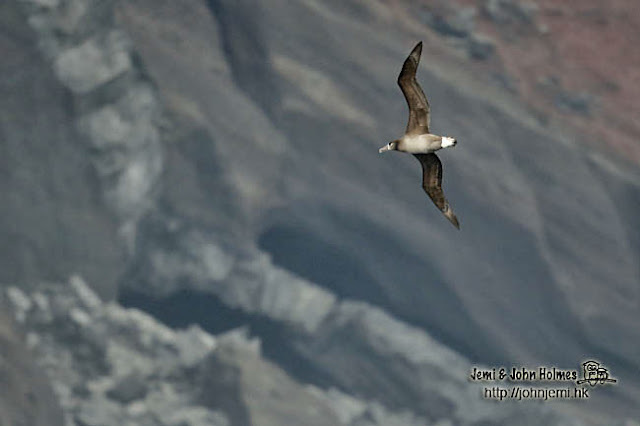 As can be seen from the introductory photos, the island - a designated Nature Conservation Area -reaches straight out of the ocean at a 45 degree angle. 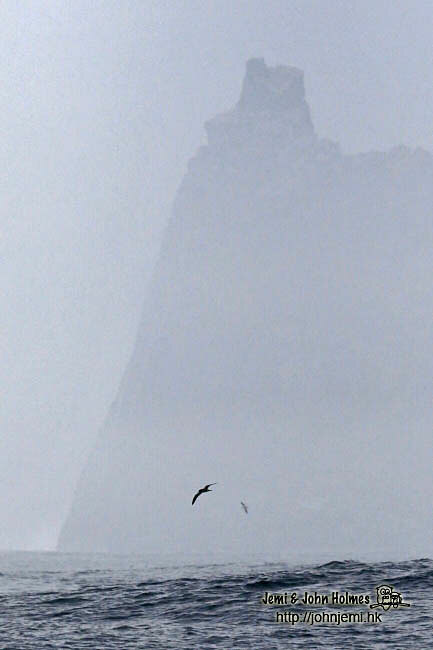 The summit, at 916 metres, is the highest in the whole chain of islands stretching back to Tokyo, and is often capped by its own patch of cloud cover. 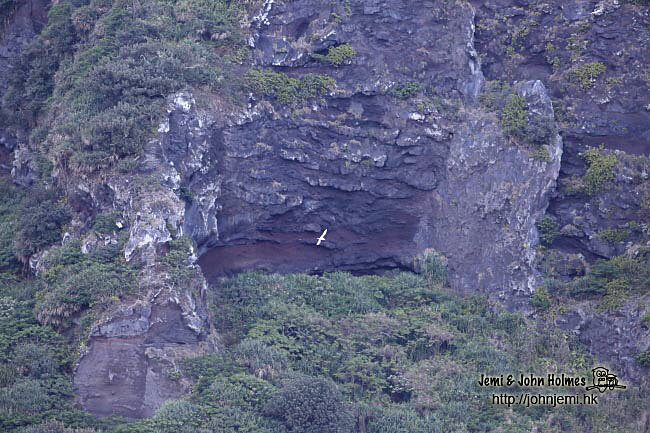 Too steep for any human activity, Minami Iwo Jima has never been settled by humans and is a breeding ground for many different species of seabird. There was a sizeable party of Brown Boobies on rocks at the foot of the island, and the occasional fly-by bird with a breeding flush of blue. 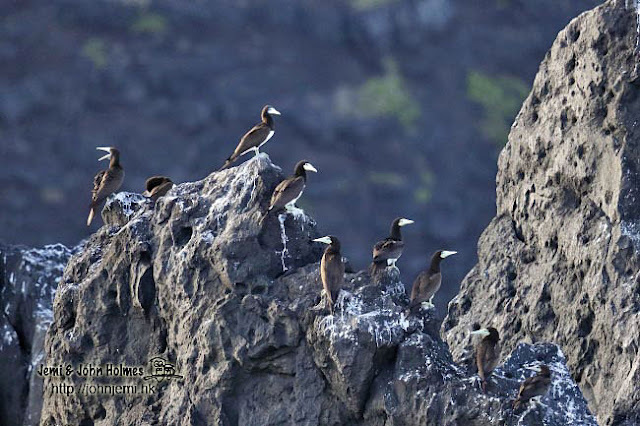 Higher up, there was a breeding colony of Red-footed Boobies. 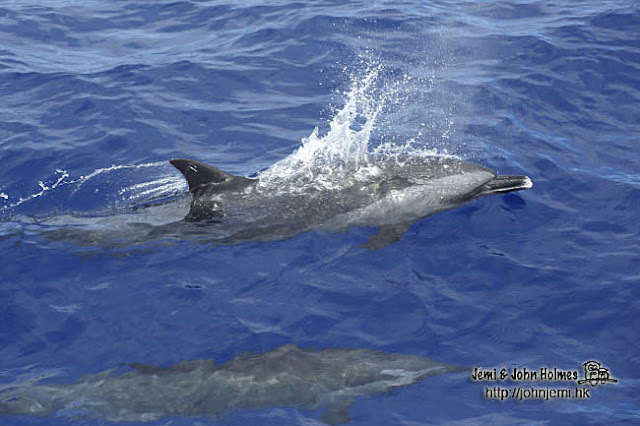 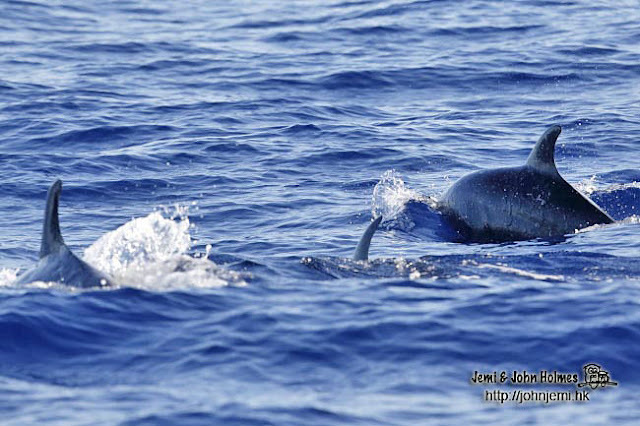 We encountered a small pod of Bottlenose Dolphins, but they didn't hang around. The slopes are also a site for breeding Red-tailed Tropicbirds, here at the northern edge of their range. 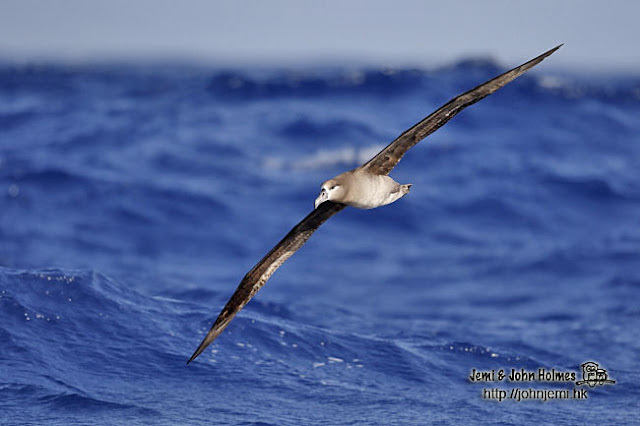 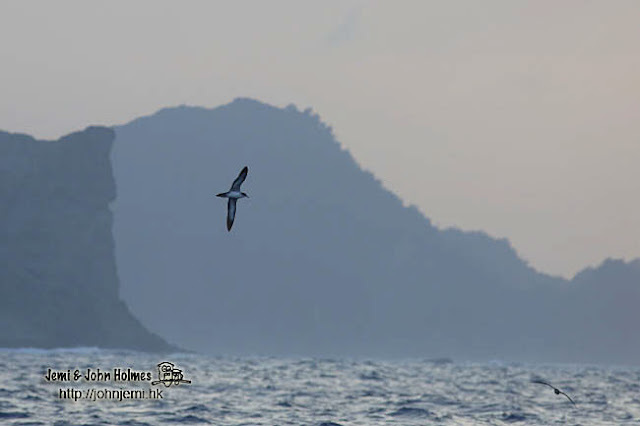 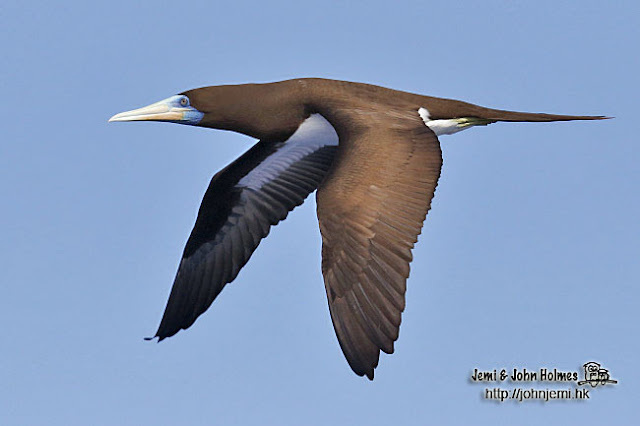 With a variety of seabirds crisscrossing the water, we went southwest of the island and saw two or three distant Bannerman’s Shearwaters returning to the island in the late afternoon. 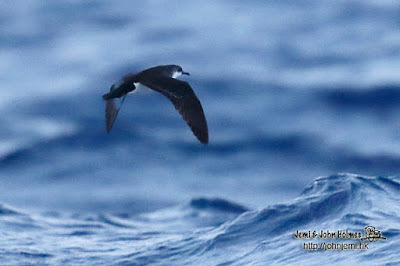 Over the next three days we saw a few dozen more of these Endangered birds each day. 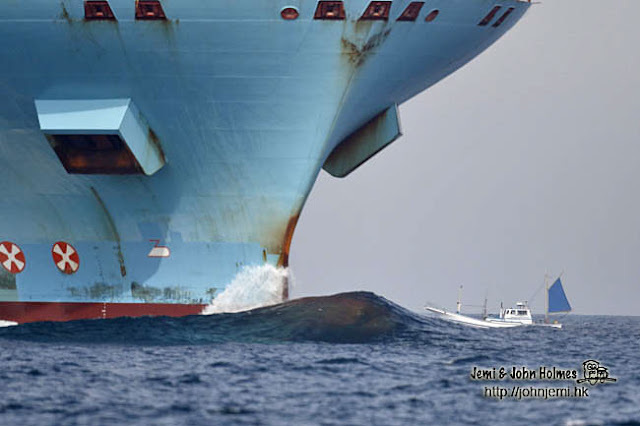 They paid little attention to the boat. As pointed out by Chikara Otani in his paper in Birding Asia 16, the illustration and description in Albatrosses, petrels and shearwaters of the world (Onley and Schofield, 2007) for Bannerman’s Shearwater is quite wide of the mark. 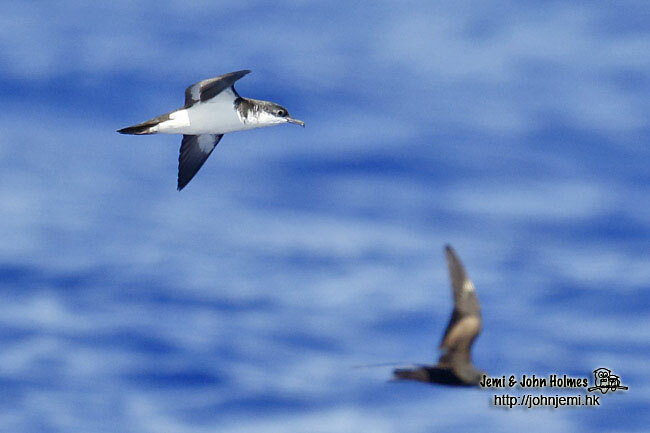 A "split" from Audubon's, Bannerman's Shearwater mostly resembles other formerly-known-as-Audubon's Shearwaters, as well as Audubon's itself. 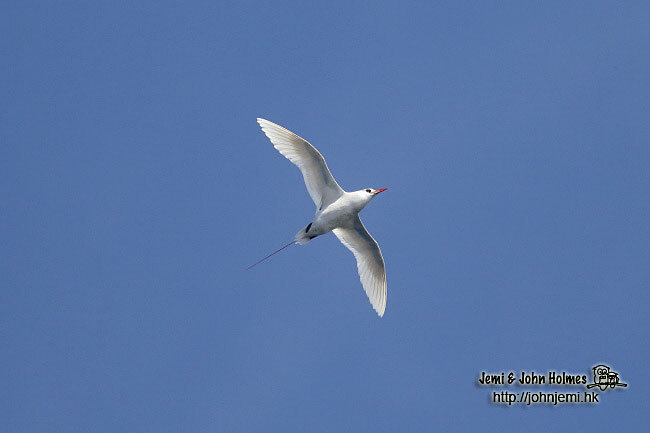 Most shots we got were flight shots, but we did sometimes get views of birds on the water, such as here. 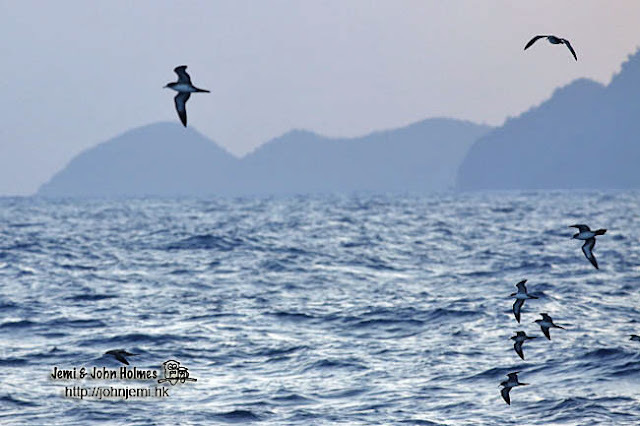 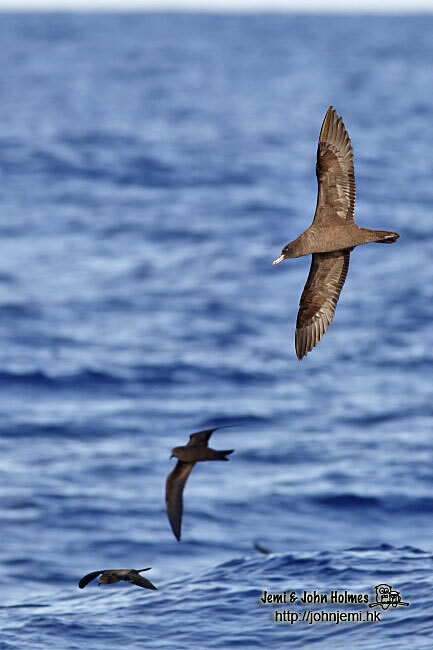 Bannerman's Shearwaters were outnumbered by the larger Wedge-tailed Shearwaters in the area, both in the air and on the water. Despite the effort put in, we didn’t encounter Bryan’s Shearwater - the obvious conclusion being that they must be very rare indeed, even in comparison with species like Bannerman's Shearwater. 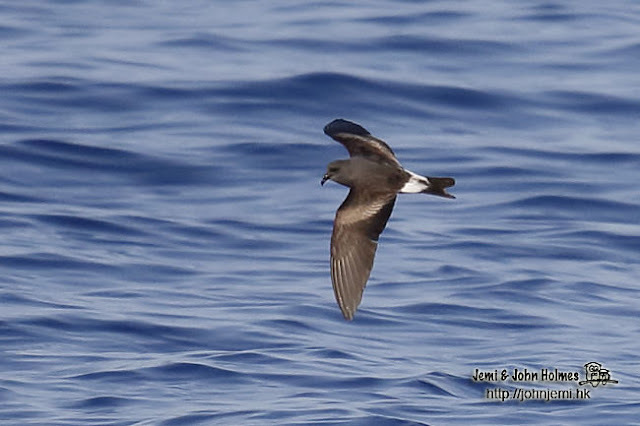 Day counts of Bonin Petrels ran to several hundred. And wherever we went, the island was always in view, sometimes up to 50 kms away. although Matsuadaira’s were far more numerous. 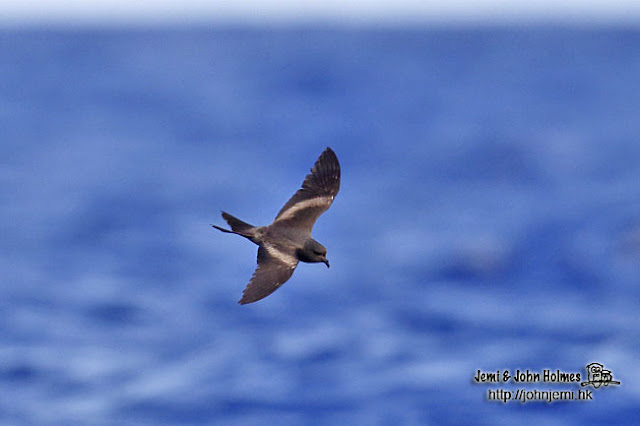 Minami Iwo Jima is the only place Matsudaira's Storm Petrel is known to breed. Only one or two Flesh-footed Shearwaters showed themselves daily, here’s one with a couple of Matsudaira’s. 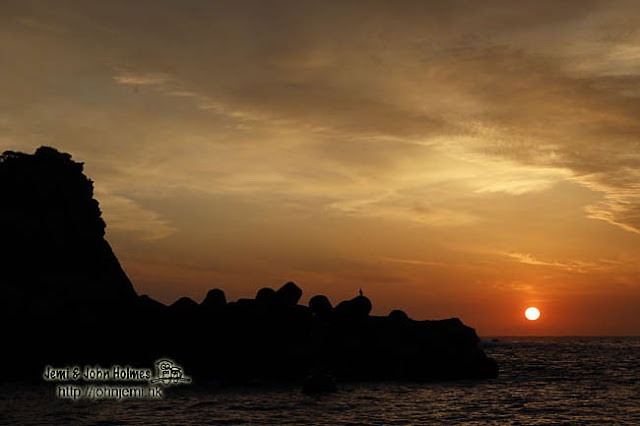 We knew we’d been fortunate with the weather conditions up to this point, but my lasting impression was of a place where the sunsets…. 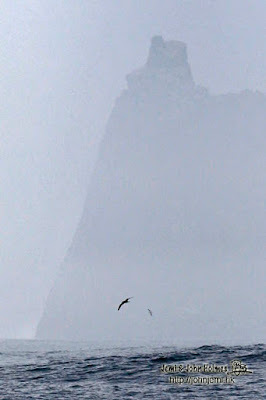 just seemed to go on forever….